Given our vast industry experience and our expertise, we act as manufacturer and trader of Metal Earthing Rod to our clients. 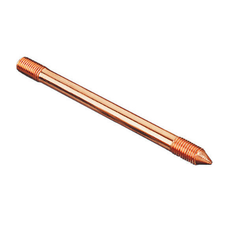 This Metal Earthing Rod is acknowledged for its high durability and best performance. With firm commitment to quality, we are involved in offering a wide range of Galvanized Earthing Rod. This rod is used as a reference point in an electrical circuit or system. Offered rod is manufactured by our diligent team of professionals using excellent quality basic materials with the help of cutting-edge methodology. Further, this rod is made available in various dimensions as per the exact needs of the clients. 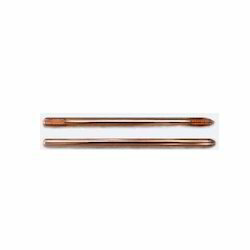 We a well-known firms in the domain, engaged in offering excellent quality Copper Earthing Rod. Under our experts' direction, this earthing rod is manufactured by utilizing premium grade raw material with the help of modern technology. 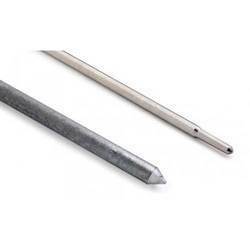 This rod is used as a reference point for measuring voltage. Moreover, this earthing rod is widely appreciated in market for its high endurance. Our proficiency in this domain enables us provide a broad array of Copper Bonded Earthing Rod. This rod is well suited for measuring voltage from a reference point in electric circuit. The provided earthing rod is precisely manufactured with the help of latest techniques using the superior quality metal alloy in accordance with predefined industry norms. In addition, this rod is available in numerous specifications to meet the needs of the clients. Looking for Metal Earthing Rod ?